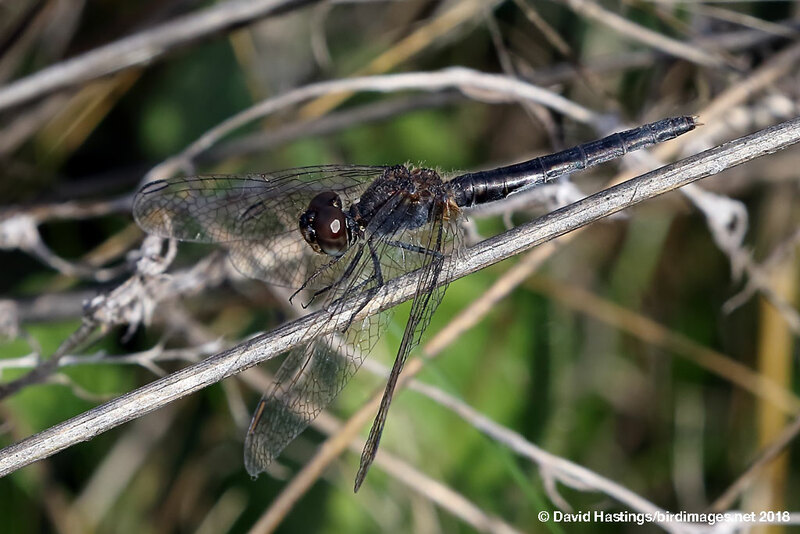 Black Percher (Diplacodes lefebvrii). Male. Taken in Extremadura, Spain, on November 15th 2018. Approx 4.75x lifesize. Male. Taken in Extremadura, Spain, on November 15th 2018. A small dragonfly. The males become all-black, including the appendages. Females and immature males are straw-coloured. The wingtips are rounded, and the pterostigma are large and brownish. Common throughout Africa, it is also found around Mediterranean coasts, and further inland in Iberia. Its habitat is open marshes, and on the grassy or swampy edges of pools and lakes. Adults are probably on the wing all year in the Sahara, but from April to November in the Mediterranean basin. Males perch among marsh vegetation and and are quite aggressive.